EVE Vegas has come and gone and in between the drinking and carousing some interesting details of future changes were given by CCP. If you haven’t seen the slides from the keynote you can find them all here. There aren’t many of them but they are all worth a quick read. There were some interesting things for life in w-space announced at EVE Vegas and this week we are going to take a look at them. CCP announced the addition of a new type of Tech 3 ship coming in Rhea in December; Tactical Destroyers. 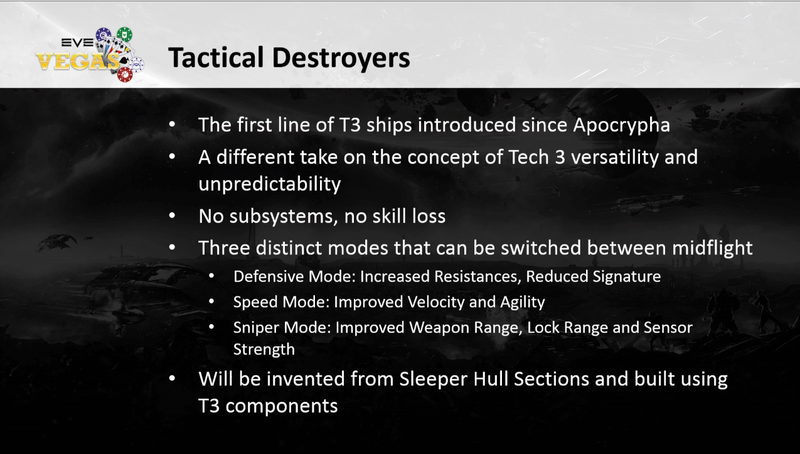 We don’t know anything about the stats of these ships yet, but we do know a few things from this slide: The biggest thing to notice is that these ships will not have subsystems or incur a skill loss upon destruction the way current T3 ships do. Whether that means CCP is going to scrap the idea of skill loss is anybody’s guess. It likely just means that because these ships have no subsystems they will only require one racial Tactical Destroyers skill per ship, rather than the racial skill plus five racial subsystem skills (which are subject to skill loss with the T3 cruisers). It is probable that CCP wants to keep the skill loss a mechanic only for subsystem skills, and make all types of T3 ships have different gameplay mechanics. Speaking of the mechanics, Tactical Destroyers will have three modes of flight that can be switched at any time. There is no word on a cooldown when switching between the modes or how the mode switching works, but I would assume one will be in place in order to encourage players to be smart about when they switch from one mode to another. A cursory look at the bonuses for the three modes makes it seem that these ships will perform best when kiting or sniping from long range. This might make them a tougher fit into the typically brawl heavy meta of w-space, where you want to be close to your enemies so you can follow in case they jump through a wormhole during combat. However, if the defensive mode provides good enough bonuses to resists you could try fitting short-range weapons on it and staying up close under logi support. We will have to wait for CCP to announce the stats of each ship as Rhea gets closer to release in December. So how will these fit into w-space? Well, for starters their creation will involve items from sleepers, which will likely lead to an increase in people daytripping into w-space looking for these items due to their increased price tag. Many players had reservations about the new frigate wormholes because of the low EHP of frigates, so convincing those same players to fly a new T3 destroyer that will likely have a large “Primary Me!” sign on it might be tough as well. Players have been asking for more T3 ships for a long time now so unless the numbers on these things are abysmally low I think people will at least give them a shot all over New Eden. CCP spoke of new weapons (some of which should be released with Phoebe on November 4th) that they are referring to as “glass cannon weapons.” A glass cannon is an RPG/MMO term for having lots of offense but little to no defense, and these weapons fit that idea perfectly seeing as they set your ship’s resists to 0, while granting a substantial boost to damage output. There is a little more info on this Reddit thread and if you want some theorycrafting on possible damage bonus numbers you can look here. What will these weapons mean for w-space, or for the game in general, for that matter? We don’t yet know the damage numbers so it’s anybody’s guess, but we have to assume that they will be relatively high in order to justify their use. Having your resists all set to 0% could be far too dangerous for site-running in a wormhole (sleepers hit hard and switch targets a lot), but I have no doubt that people will try in wormholes of all classes. Their use in PvP should be interesting as you could do all sorts of things like bringing a shiny ship in your fleet with a brick tank to attract the primary call of the enemy, while the glass cannon ships in your fleet chew through a couple of enemy ships before they can switch targets. This beautiful thing might seem odd to some of you. Perhaps you look at it as a great rig to put on a bridging Titan to prevent the starry-eyed newbs in your fleet from accidentally bumping it while they fly around. Maybe you are a miner and this looks like a great way to mine while aligned to a station, allowing you to stay in range of the asteroids for longer while also making you harder to bump? Those are both valid uses for this rig, but the best use for it will be in w-space where we will use ships rigged with one of these to roll wormholes much easier. The added mass will allow you to use fewer ships to roll a wormhole, enabling you to get it done in much less time. The velocity penalty will mean you are probably better off web-warping the ships to a bounce point and then web-warping them back for the return jump rather than slowboating to the hole. 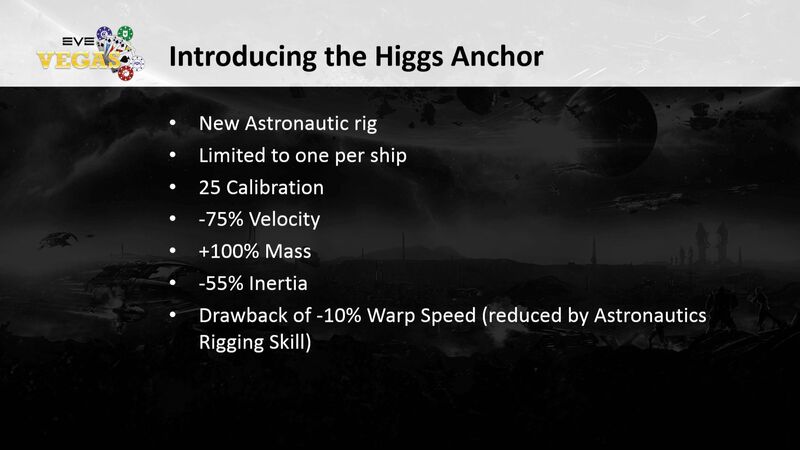 The Higgs Anchor will also help players living in lower class wormholes who have issues rolling some of their connections due to strange maximum mass limits and not having ships that fit perfectly within them. Expect players to theorycraft the perfect hole rolling fleet for their static(s) as soon as these are available. Some Exploration Changes and Join W-Space! The dev blog about the changes for Phoebe mentioned null sec exploration sites being added to wormhole classes 1-3. This dev blog goes into some more detail about further exploration changes, but the interesting parts for w-space involve improving the potential payout of data and relic sites. CCP are also lowering the volume of the items you find, allowing you to carry much more loot in your cargo than before, giving the loot fairy even more items to destroy in your wreck if you die. 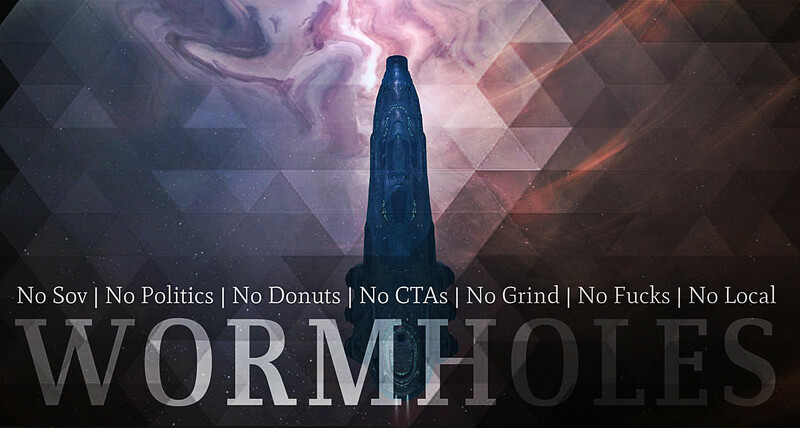 More and better PvE content for wormholes will hopefully lead to more people visiting (and perhaps living in) wormhole space. Which is a great segue for… Hidden Fremen from Lazerhawks has a Reddit post about a new in-game channel “Join W-Space” that acts as a way for players interested in w-space to ask questions and talk to experienced w-space pilots. The channel is a neutral channel meaning it isn’t the new Lazerhawks recruitment channel, it’s just been created by somebody from Lazerhawks and any player from within w-space is free to go there and answer your questions. If you are interested in potentially getting into w-space this could be a great way to start. Ok, so I wasn’t at EVE Vegas and thus don’t have a hangover, but it seemed like a fitting way to end an article discussing the event. I was happy to see even more things announced that w-space residents have an interest in, and the addition of tactical destroyers with Rhea seems exciting. I also don’t want to start speculating too heavily, but image #3 from the keynote slides makes it appear that we are nearing the time that CCP will finally be changing the POS mechanics. It’s still likely a long ways off (probably somewhere in the middle of next year or later) but the possibility of getting what we have been dreaming of for so long just can’t go unmentioned.